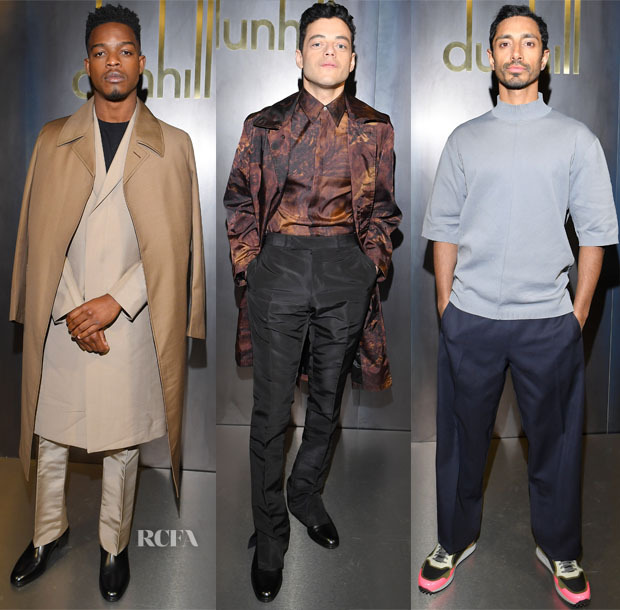 dunhill presented their Fall 2019 fashion show during Paris menswear fashion week, and they invited some of Hollywood’s best dressed men to the event hosted on Sunday (January 20). Stephan James: Three different colours and textures makes for one undeniably suave dunhill look. I know some of you feel the double coat is a little contrived – as stated on Allison Williams post – but it’s that cold in Europe that two coats feel mandatory. Rami Malek: Also opting for silk faille skinny trousers, the Golden Globe winner’s dunhill look focuses on the vibrant print of his walnut dash shirt and mac combo, which immediately catches your eye within this trio. Riz Ahmed: Casual, yet smart and on-trend, I feel myself forgiving Riz for those multi-colour dunhill ‘Radial Runner’ sneakers, when a simple white or navy pair would’ve been preferred. Ben Hardy: The ‘Bohemian Rhapsody’ English actor opted to toughen up his look with a leather dunhill jacket that upholds the label’s exquisite British tailoring at heart. Joe Cole: The ‘Peaky Blinders’ actor has a more success in the sneaker department, as his white ‘Radial Spoilers’ don’t compete with his khaki sleek suit. Joe Alwyn: ‘The Favourite’ and ‘Mary Queen of Scots’ actor opted to complete his wintry styling with moto-dapper attitude through this shearling jacket.